Eat like a local on a Hong Kong food tour and discover why Hong Kong is one of the food capitals of the world! Private food tours can be booked any day of the week and can start any time between 9 am and 2 pm. 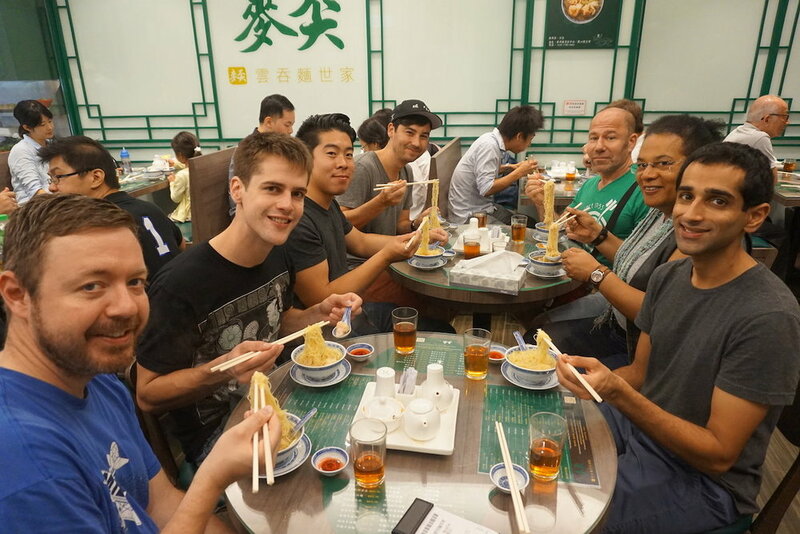 Hong Kong food tours start in the Sheung Wan area of Hong Kong Island. Full details on the meeting point are provided upon booking. Alternatively, book an ‘extra hour for hotel pick up’ and have your guide come and collect you from your hotel lobby. Tours last 4 hours (or 5 with a pick up) and finish in Wan Chai or back at your hotel. Eat like a local on a food tour. This food tour is a perfect introduction to Hong Kong’s food. It is ideal for people who want to enjoy delicious, high-quality local food in local eateries. There is nothing weird and wonderful on this tour (apart from the chicken's feet!). If you are a more adventurous eater please ask us for a Kowloon food tour and we will focus on street food. Over the course of the food tour, we will undertake an exploration of Hong Kong’s food culture. Hong Kong food is primarily Cantonese cuisine but with some small key differences which reflect the city’s mixed British and Chinese heritage. On this tour, we learn about the history of food in Hong Kong, from the traditional fare from Guangzhou to the interesting western crossover cuisine that started popping up in the 1950s as local chefs tried to produce cheap versions of British and Western favourites. We start the day with a traditional Dim Sum breakfast in an old tea house. We find ourselves transported back to a bygone era as we sample the most authentic Dim Sum available in HK. This is the granddaddy of Dim Sum restaurants, it's crowded, it's noisy, it has a 90-year history in Hong Kong and the Dim Sum is still served via trolley service. After our second food sampling, we take a tea break and try a cup of Milk Tea, perhaps the most pervasive legacy of British rule. It’s not everyone’s ‘cup of tea’ but it is a fascinating beverage that Hong Kongers love! After our tea break, we travel by Ding Ding (tram) to another family-run restaurant, which dates back to the Qing Dynasty (pre-1900’s) and is renowned for its Siu Mei, or in English, Roast Meat. Here we sample the best Char Siu (BBQ Pork) in Hong Kong, cooked in the traditional style, served with rice and homemade sauces. This is another Michelin recommendation and a favourite of the renowned chef and food critic Anthony Bourdain. We finish the Hong Kong Food Tour with a Hello Hong Kong favourite, an Egg Tart, or in Cantonese, Dan Tat. This is another Chinese take on an English speciality - the custard tart. Like our other restaurants, the bakery we visit has a long history in Hong Kong and is a personal favourite of former HK Governor Chris Patten. Hello Hong Kong Tours in the press! All prices listed are in HK$ and are the total price for the tour. The price includes all of the food and speciality drinks consumed during the tour. Prices listed do not include the costs of transport to get to and from the start and end points of the tour but do include the costs of public transport used during the tour. On certain days some of the food stops might be closed. In these cases, we substitute in a very similar replacement. 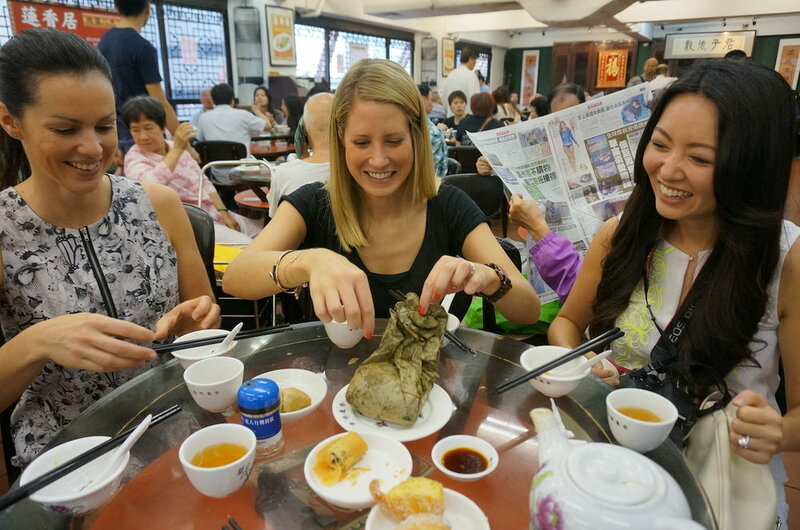 This private food tour of Hong Kong is just for you and your friends/family. No one else will join your tour. You can bring a maximum of 12 people on your tour. For numbers over 9 people please add HK$400 per person. There is a small surcharge of HK$200 for anyone aged between 7 and 11 years old. Extra hours are HK$300 for the entire group. Throughout the tour, you will discover the histories and stories behind the foods that we eat, as well as the restaurants that you eat them in. This tour will give you a solid understanding of what it means to ‘eat like a local’ in Hong Kong. 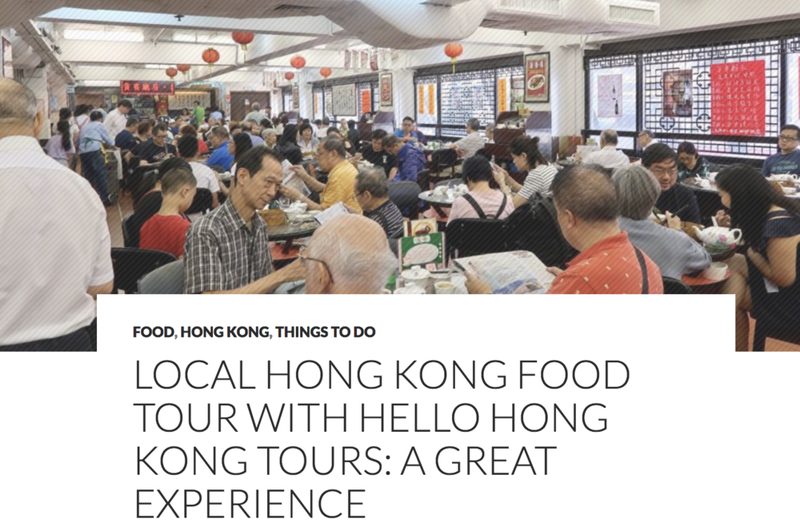 In addition to the restaurants listed above, we also visit a local Dried Seafood Shop to take a look at the ingredients that are traditionally used in soups, a Chinese Medicine Shop originating from 1946 and Hong Kong’s oldest Wet Market. During our travels between eating points, we also discuss the districts that we journey through and buildings of key historical importance. The areas we visit are Sheung Wan, Central and Wan Chai. This is a walking tour and you should expect to walk about 3km or 1.5 miles in total. Our walking tour includes a very small hill and a few stairs. You will also need to be able to get yourself on and off a local tram (trolly). If you have walking difficulties we can flex the route for you and make use of the occasional taxi (payable by yourself but very low cost). WHEN/TIME: Monday to Saturday. We can do a food tour on Sunday but two of our regular foodie stops are closed so we will use substitutes. Hong Kong Food tours last 4 hours, 5 hours if you add on an extra hour for a hotel pick up or extra sightseeing. STARTING POINT: Outside the first food stop which is in the Sheung Wan district of Hong Kong Island. Directions, maps and pictures for the meeting point are sent upon booking. Alternatively, add an hour to your foodie tour for a hotel pick-up. END POINT: Wan Chai (instructions on how to get back to your hotel or to your next activity will be provided by your guide). DIETARY REQUIREMENTS: There is a lot of meat (mostly pork) and seafood (shrimp) in this tour. If you are unable to consume meat and seafood then we suggest that you take a customised tour rather than a food tour. We have taken people on the tour who have not been able to eat many of the foods and they have still enjoyed the tour as there is a lot of cultural and historical information but we would suggest that a non-food tour would be a better option. We CAN accommodate gluten-free guests. Please click here to find out how well we can accommodate your specific dietary requirements. WHAT TO WEAR: Comfortable shoes. WEATHER CONDITIONS: All tours take place as scheduled except under Red/Black storm warning or Typhoon #8 or above. For up to date information see the Hong Kong Observatory website.